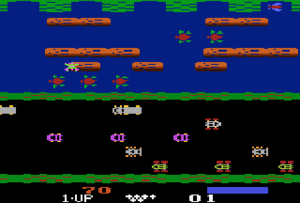 Parker Brothers acquired the rights to release Frogger for home systems on cartridge format. Released in 1983. Considered a surprisingly accurate conversion given the system's limited capabilities. Released in 1983. 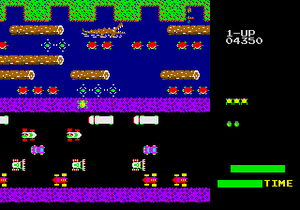 The 5200 version was identical to the 8-bit home computer version. Released in Europe in 1982 and in Brazil in 1984. Rather well done, considering the limitations of the system. Rather than try to display both parts of the game on the screen at one time, the game was broken up in to two screens. 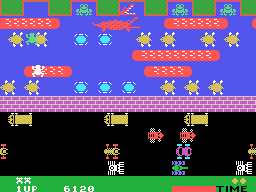 Sierra acquired the rights to release Frogger for home systems on cassette and diskette format. Released in 1983. 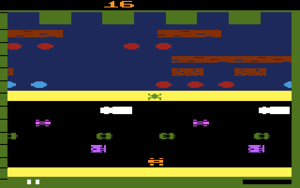 This version loaded in from cassette via the Supercharger hardware add-on that also provided the Atari 2600 with additional memory, which allowed for a more sophisticated conversion of the game than Parker Brothers' conversion. 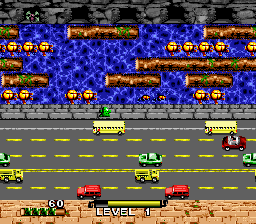 Majesco re-released Frogger on third generation platforms. Released at the very end of 1999. Released in 1998. 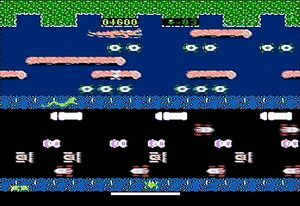 Extremely arcade accurate, the most faithful conversion of Frogger ever made for a single-game release. Released in 1998. Features a higher resolution graphics set. Released for play on the Xbox Live Arcade in 2006. 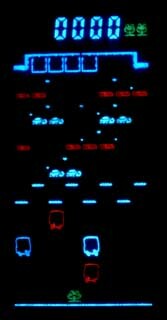 Before Coleco launched the ColecoVision, they manufactured a series of table-top games based on several popular arcade games. These table-tops were designed to look exactly like miniaturized arcade machines that you could take home and play. Naturally, the game play wasn't spot on, but it was rather close, given the limitations of the technology. 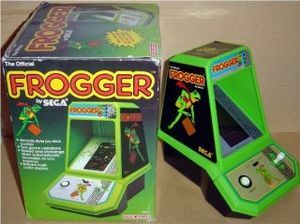 The Frogger table-top featured one joystick and a start button, which the player would push to initiate play. There were two skill levels with a different number of lilypads that need to be filled in at the top to advance to the next stage. 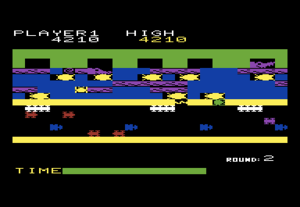 Just like the arcade game, the objects that occupy the traffic lanes must be avoided while the objects that traverse the river lanes must be ridden upon without crossing the boundaries of the screen. Coleco's design was purchased and distributed outside of the United States by tow companies Gakken and CGL in a different yellow case. Other Coleco table-top games include: Pac-Man, Galaxian, Donkey Kong, Ms. Pac-Man, Zaxxon, and Donkey Kong Jr. (which was directly licensed from and manufactured by Nintendo). 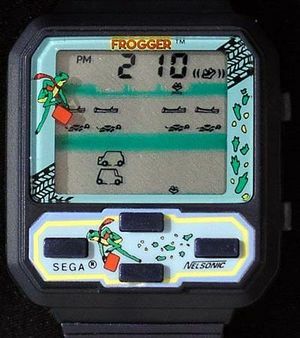 Nelsonic created a line of digital watches that were capable of playing video games, including Pac-Man and Q*Bert. 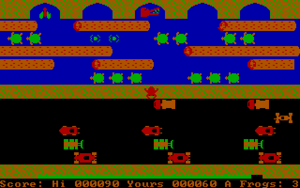 The gameplay of the watch is a shortened version of the tabletop (two rows of traffic instead of three, and two rows of river instead of four) with a fixed number of positions for the frog to land in (three). 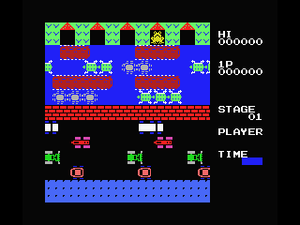 In 2009, Kevin Hanley developed a homebrew port of Frogger for the NES entitled Ultimate Frogger Champion, which was published in cartridge format by Retrozone. 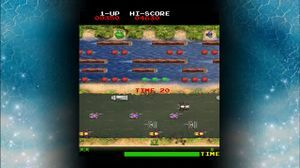 In addition to being a very accurate port of the arcade game, it features a remix of the original background music, and two-player simultaneous competitive play. This page was last edited on 10 August 2016, at 06:14.